The inspiration for the electric sQuba was the animated Lotus Esprit driven by James Bond in The Spy Who Loved Me. 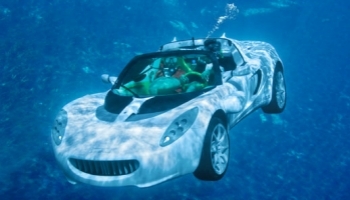 During the thirty years since the movie premiered, Rinspeed founder and CEO Frank M. Rinderknecht wanted to build a car that could move underwater like a submarine. 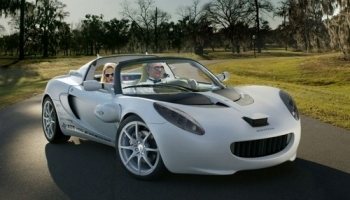 The existing, functioning prototype cost more than US$1.5 million to build. When the sQuba enters production, they are expected to "cost less than a Rolls-Royce", according to Rinderknecht. A production schedule has not been made. The sQuba is a zero-emission, all electric vehicle which uses three electric motors, one for land travel and two for water. It drives on land powered by its electric rear-wheel drive powertrain, utilizing rechargeable lithium-ion batteries. Upon entering water, it floats on the surface until the operator floods the interior to submerge it. It can be submerged to a depth of 33 ft, powered by twin electric-powered propellers supplemented by two Seabob water jets. It "flies" when underwater, like a submarine, as it is not designed to drive along the surface at the bottom of the water. The car's top land speed is 75 mph. On the surface of water, the top speed is 3.7 mph and underwater it is 1.9 mph. The vehicle can transport a driver and passenger in its open cockpit. The open cockpit design is intended to allow the occupants to escape easily in case of emergency. When underwater, the occupants breathe air carried in the vehicle through scuba-style diving regulators. Without occupants, the sQuba will surface automatically. The twin water jets mounted on rotating louvers at the front of the vehicle provide steering and lift while it is underwater and the propellers at the rear provide forward movement.